Eight weeks ago two things happened. I ran for the first time in 8 months (and not again since!) and the next day our basement flooded. Three inches of water covered our basement from wall to wall after a spring melt combined with a sump pump failure. We were literally walking on water, watching the carpet (finally laid and finished in November) wave and ripple under our feet in response to our footsteps. Since then we have been hit with wave after wave of frustration, fear, and heartache. I have at times felt like I no sooner get to grab a breath before being broadsided by another wave that leaves me sputtering. Unexpected car repairs and unfortunate speeding tickets in the wake of the basement flood. Walking with family members through unexpected deaths, broken hips and surgeries, cancer scares snd mysterious illnesses, countless doctors appointments, another minor basement flood when we were hundreds of miles from home, job stresses, kid worries…crashing waves…sputtering breaths. This is what life looks like sometimes. There are days and weeks sometimes when it’s difficult to tell if you are walking on the water or just simply drowning in it. I think of Peter and the storm that he and the disciples were in the midst of when he got out of the boat to walk towards Jesus on the water. I am sure he was being pounded by the waves-it was storming! This, the waves and the wind were eventually what caused him to take his eyes off of Jesus and to sink. It’s where your eyes are focused as the waters pound you that makes all the difference between the walking and the drowning. It’s not the waves themselves. It’s an internal peace running parallel with the turmoil and strife that buoys your spirit. Satan would love nothing more than to pull our eyes off of Christ in the midst of struggles. Satan is the founder of frustration and distraction. There have been many times over the last weeks when I have been worn down-by frustration, by fear, by the exhaustion of treading water. But I keep coming back to the morning after the flood and a promise that God has made. We were exhausted and still facing a mountain of ruined, sopping wet carpet and padding and accumulated basement stuff that had to be hauled up and out and I had this one thought-God works all things-even basement floods-for good. I don’t know what the good is going to look like in any of the pounding waves that we will face. It’s been eight weeks…and while the waters have begun to calm I am still waiting on the good from the flood. I am looking for the rainbow and the olive branch. In the meantime we’ve been living like hoarders with all of the basement stuff packed into the dining room and music rooms, paths running through each room, and a towering pile of it in my garage. Here is the bottom line, I do know that this is more about the process than the product. This is about the refining of gold, the structuring of faith. This is about the building of trust when nothing makes sense and everyday seems like a fight. 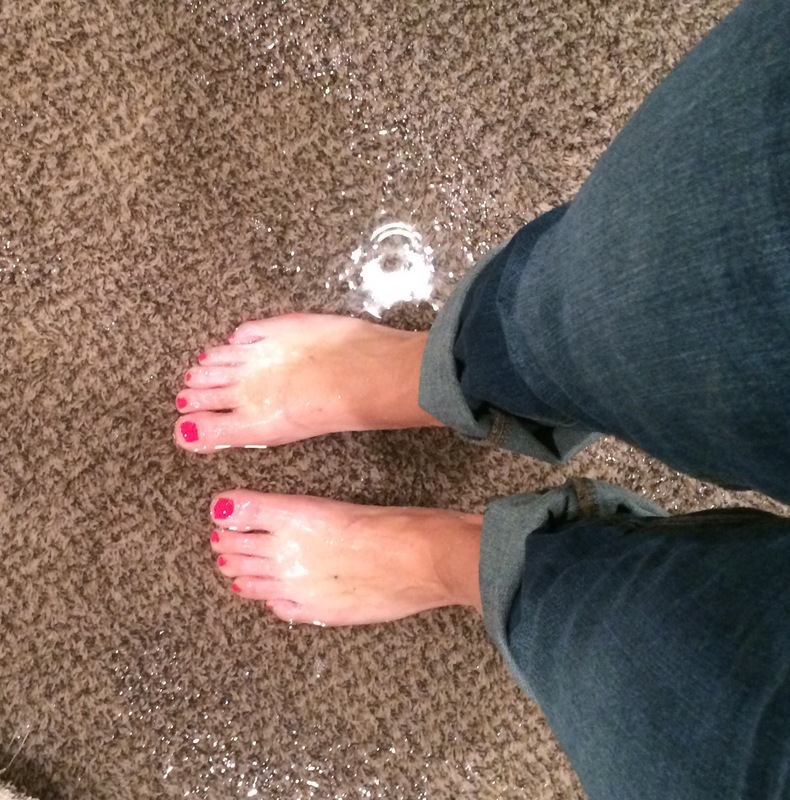 God uses it all…even flooded basements.